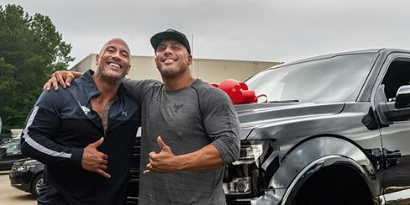 The Rock surprised his stunt double, Tanoi Reed, with a custom truck. Reed, also The Rock's cousin, thought he was meeting him for an interview about their career together. What he got instead was so kind and unexpected that it actually moved the man to tears. The Rock is Hollywood's highest paid actor - his total net worth is $220 million. A former WWE wrestler, The Rock is famous for roles involving great action scenes. For every action scene, Reed is actually the man that we see doing the crazy stunts. Over the years, these stunts have caused broken bones, torn ligaments, and severed tendons. The Rock wanted to thank his cousin by doing a big gesture and says in his Instagram post that "we're just getting started." While hard to make out the exact model in the video, the truck appears to be a brand new black, lifted Ford F150. According to IMDb, Reed has appeared in 17 films as The Rock's stunt double. In the Instagram video, The Rock refers to himself as "Dwanta Claus." He admitted on Jimmy Kimmel that he has a strange addiction to buying cars and giving them to people - "I have this problem, I do have an issue. It's a little sickness that I have. Where I really enjoy buying cars and giving cars to people...I'm a big, brown, bald, tattooed Oprah." He did specify that he only does it for friends and family and that he won't do it if someone asks for a car. He enjoys the element of surprise, apparently. So if anyone wants a car from The Rock, become his friend and don't ask for a car - easy, right? Do you have any strange addictions like The Rock? Let us know in the comments section below. For more random acts of kindness, be sure to subscribe to The Sitch.